Goal: Support implementation and tailoring of evidence-based interventions by providing data that contextualizes health behavior within social and physical environments, with a particular focus on tobacco, nutrition, physical activity and STD/HIV prevention. The Neighborhood Environmental Assessment Project (NEAP) is a systematic environmental mapping project intended to provide researchers and community partners with geographically linked indicators associated with healthy lifestyles. Since 2012, the NEAP team (comprised of students and staff) has mapped, inventoried, and annually updated a database of all food retail outlets in the city of Cleveland and select suburbs (n=1400). 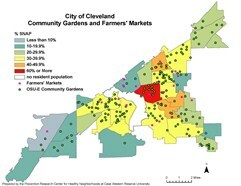 In addition, the PRCHN conducts period inventories of community gardens and other urban agriculture sites (i.e., market gardens, farmers markets); parks and green spaces; and the school food environment in Cleveland K-8 schools. The PRCHN has a long history working with the local and state level YRBS data, spearheading the effort to collect local data as far back as 1995. The PRCHN (and preceding centers) has administered the local YRBS in more than 188 schools across Cuyahoga County since 2009. In addition to using local YRBS data in presentations at academic and other conferences and articles in peer-reviewed journals, the PRCHN produces data briefs, Spotlights, and infographics based on YRBS data. In 2002, the PRCHN helped to establish the Cleveland and the Cuyahoga County BRFSS, in collaboration with Cleveland Department of Public Health and Cuyahoga County Board of Health, both mirrored after the national BRFSS.